Corticosteroids Pharmacology | All the Facts in One Place! Corticosteroids are an important class of medicines. They are used to treat a wide variety of disorders – including allergic, inflammatory and malignant disorders – and so remain a vital and relevant drug class in the clinical setting. There are two classes of corticosteroid – glucocorticoid and mineralocorticoid. Glucocorticoids are responsible for a wide range of physiological effects – including anti-inflammatory, immunosuppressive, anti-proliferative and vasoconstrictive effects. This contrasts with mineralocorticoids whose responsibilities include regulation of bodily electrolyte and water balance. – Allergic and inflammatory disorders; suppression of autoimmune disease; as part of a wider chemotherapy regimen; hormone replacement in conditions such as adrenal insufficiency. – In the treatment of asthma and chronic obstructive pulmonary disease (COPD). – Treating inflammatory skin diseases, such as eczema and other skin flare-ups. Though glucocorticoids are associated with a broad range of indications – much broader than the general list of indications above – they still share a common mechanism of action. Glucocorticoids work by modulating gene expression. Glucocorticoids achieve this by binding to receptors in the cytosol – known as glucocorticoid receptors (GR). Through this binding, the receptor passes into the nucleus and binds to glucocorticoid-response elements – binding which influences gene expression. Glucocorticoids also have metabolic effects. For example – they increase gluconeogenesis from circulating fats and amino acids which have come about through the catabolism, or breakdown, of muscle and fat. The metabolic effects directly contribute to the side effect profile reviewed below. For systemic inflammatory disorders, this has an enormous impact. Glucocorticoids also impact circulating monocytes and eosinophils, suppressing their effects. Inhaled corticosteroids directly impact the respiratory tract – reducing mucosal inflammation, widening the airways, eliminating mucus secretion and reducing the number of flare-ups in patients with COPD. Topical corticosteroids have a local effect. However, prolonged use of high doses can also trigger systemic side effects. Given the many ways in which glucocorticoids – as hormone-based drugs – interact with the body, they are also associated with a wide range of potential adverse effects. Glucocorticoids are associated with their own range of potential side effects. Side effects invariably depend upon the route of administration. For example, systemically administered corticosteroids are associated with more serious, systemic effects whereas inhaled and topical routes are more associated, though not exclusively associated, with local effects. Chronic use of systemic corticosteroids is also associated with more serious effects. Oral candidiasis, thrush and hoarse voice are common effects with inhaled corticosteroids. Inhaled corticosteroids, when taken by children, have been linked to growth retardation – a risk particularly associated with inhaled fluticasone. Topical corticosteroids are linked to skin thinning, striae, dermatitis and worsening acne. That when taken with NSAIDs, glucocorticoids increase the risk of gastrointestinal bleeding. That when taken with loop diuretics, thiazide diuretics or beta-2 agonists, glucocorticoids increase the risk, or worsen, the effect of hypokalemia. That patients should be warned about the increased risk of fracture. That corticosteroids increase the risk of developing infections. They are also known to limit the efficacy of vaccines, too. For this reason, caution should be taken prescribing these drugs to patients with an existing infection. That sudden withdrawal from chronic glucocorticoid therapy may induce a serious Addisonian crisis – gradual withdrawal from these drugs is needed to help the adrenal gland recover its normal biological duties. Co-administration with other drugs – such as proton-pump inhibitors or bisphosphonates – may be warranted to offset the chronic potential side effects of glucocorticoids (stomach irritation / decreased bone density etc.). That once daily glucocorticoid treatment should be taken in the morning. This helps to emulate the body’s natural circadian rhythm and reduces the risk of sleep difficulties, too. That prolonged use of high-dose inhaled corticosteroids – such as fluticasone – should be used with caution in children given the risk of growth retardation. Topical corticosteroids should not be applied where an active infection is present. This can increase the risk of the infection worsening and/or spreading. Topical corticosteroids should be applied very thinly to the skin and only to the affected area – otherwise skin damage may occur. Corticosteroids pharmacology is vast and complex – medicines that are used for a very wide array of disease conditions and states. As hormone-like medicines, they have manifold effects on the body, particularly metabolic effects – which carry enormously important clinical considerations. We have touched upon many of the primary concerns here, though we recommend using this introduction to build your knowledge in the coming weeks and months. 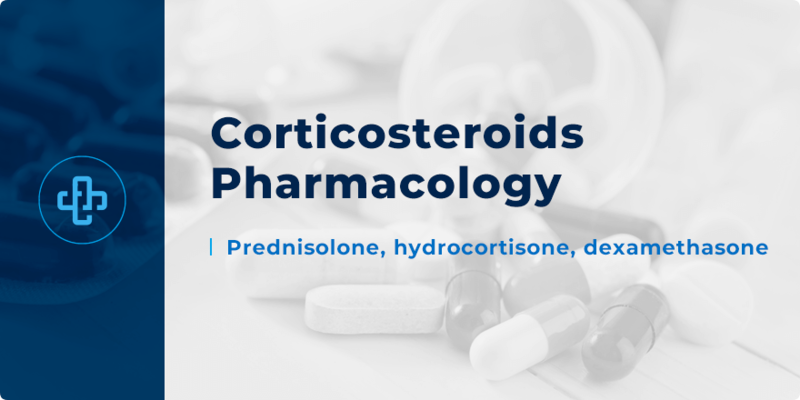 Want to learn more about corticosteroids pharmacology? Register with PharmaFactz today to gain instant access to all the resources you need – tutorials, quiz questions and more. In the meantime, take a few moments to join our pharmacy blog newsletter (above) to receive all the latest facts direct to your email!